1. Preheat oven to 450 degrees F. If using refrigerated pizza dough, remove dough from refrigerator and allow dough to come to room temperature while oven preheats. 2. Place pizza dough on a lightly floured surface. Roll pizza dough out into a circle. Make a thicker crust along edges of pizza. Brush olive oil evenly over the dough. Arrange mozzarella slices evenly over dough and top with sliced tomatoes. Season with salt and pepper, to taste. Sprinkle basil over pizza. Place in preheated oven and bake for 10-12 minutes or until crust is browned and cheese is bubbly. 3. 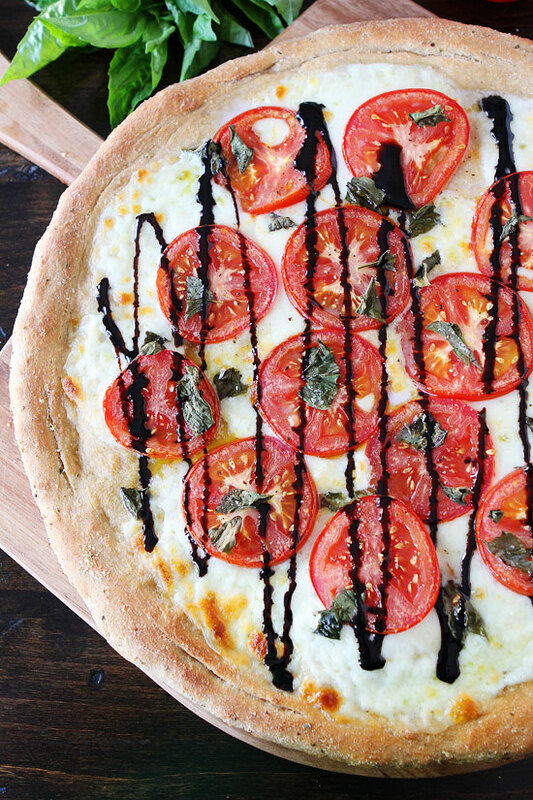 Remove pizza from oven and drizzle with balsamic glaze. Cut into slices and serve warm.